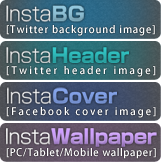 Use InstaBG to display Instagram photos as your Twitter page background. It's easy, and completely FREE. No need to register- simply sign in with your Twitter account. Specify your own Instagram photos simply by typing in your ID. You can also use public Instagram photos, selecting them by Category or Tag. *Note: you do NOT have to be a user of Instagram to create custom backgrounds with InstaBG! Auto Updates Keep it Fresh! 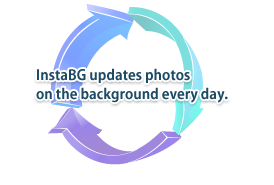 When Auto Update is switched on, InstaBG will update all the photos on your custom background daily! Attract more Twitter followers with a new look every day. Everything about InstaBG is easily customizable! Choose photo sizes, spacing and background colors. 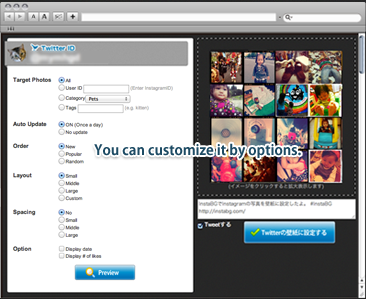 Use our Live Preview feature to get your custom Twitter background perfect for you!